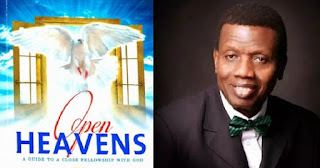 Open Heaven [15 May 2018] Divine Connection - Open Heavens Daily Devotional Messages, By Pastor E.A Adeboye. This was the testimony of Abraham’s servant in today’s Bible text. He was amazed at the way the God of his master answered his simple childlike prayer of faith. Beyond his wildest imagination, things worked out in his favour because God had already sent His angels ahead of him to work everything out. When you are divinely connected, people will think that you are wise or brilliant. Some may even mistake you for a genius! I pray for you today that God will give you divine connections that will confound everyone who hears about it in Jesus’ Name. If you have been walking with God with nothing to show for it spiritually and materially, take time to carefully evaluate your walk. If you need divine connection, you must be faithful to the profession of faith you made when you gave your life to Christ. Our calling, like that of Abraham the father of faith, is call unto holiness (Genesis 17:1, 1st Thessalonians 4:7). Abraham did not compromise his calling by going back to the world; there is nothing for you there. To be divinely connected, you need to add virtue and brotherly kindness to your faith, because faith without works is dead (James 2:17). Renew your relationship with the Lord and let holiness become your watchword. Endeavour to please Him in all your ways just as the early Church did, and you will then experience divine connection.